Want a quick, fresh-tasting meal you can throw together after a busy day? Here’s one of my go-to meals when we’ve had a hectic day. Fajitas! Fajita bar toppings for assemble-it-yourself fajitas are easy to set up and it makes entertaining easier for you. 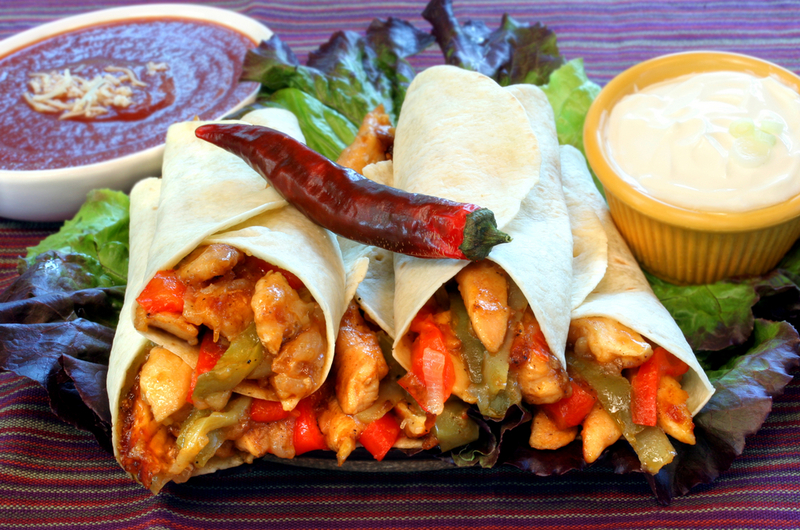 Great for game day, Cinco De Mayo, or just a great Fajita party! I love how moist and tender the chicken strips get with this method–so much better than the chicken you get in Tex-Mex fast food restaurants. And, yes, I think it’s even better than you get in a lot of more upscale Tex-Mex restaurants. I made these last night and they were wonderful. Here’s how they go together so quickly. ou can also make your own taco seasoning mix from spices you have on hand. frozen cooked chicken strips (Here’s how I make these ahead and keep them in the freezer for fast meal prep.) I use all the chicken strips that fit into one Glad sandwich size container, which holds about 3 1/2 cups of liquid. Of course you can use chicken pieces from a purchased rotisserie chicken too. Click here for a super easy avocado-tomato salad that makes a better add-in than serving avocados and tomatoes separately, in my opinion. It is much tastier and holds together better. It also discourages one person from taking all the avocados! 1. Put the frozen chicken strips on the counter to start thawing a bit. If they do not thaw soon enough, just let them soak in a bowl of hot water until they are soft. 2. Peel and slice the onion. Separate any rings and cut into half rings. 3. Put onions in skillet with the olive oil, cover, and cook on medium heat. They will cook down to about half, so don’t worry that they take up most of the skillet. 4. Wash and cut peppers into strips. 5. When the onions are getting clear, put the thawed chicken strips on top of the onions. Sprinkle some taco seasoning over all. Do not mix. Cover skillet. 6. Set out the tortillas and any “fixins” for your fajita bar. Warm the tortillas a little bit in the microwave and then cover with a clean towel to keep warm. You can keep them in the microwave to keep in the warmth until you’re ready to serve. 7. Check on the chicken every 5 minutes to break up the chicken into strips with a utensil. 8. When the chicken is separated into pieces, add the pepper strips, and stir everything. (You can add black bean at this point if you are using them.) Do not put the lid back on. Add more seasoning to taste. 9.. Continue cooking and stirring until the liquid is mostly gone. (You don’t want a drippy fajita.) Try to dry up all the liquid without burning anything. 10. Put the chicken mixture into a bowlthatis lined with paper towels. (Again, no drippy filling allowed. )Ready to spoon into warm tortillas!I generally let each person add their own red pepper flakes to get the amount of heat they like. That might seem like a lot of steps, but after you make this once, you’ll be able to fly through it. The flavors are wonderful! I used to add shredded cheese, but I find the flavors are better when not covered by cheese. And I am a cheese lover! Any leftovers? I put the mixture on a tortilla and microwave for about 40 seconds. Yum. This is healthy comfort food that really makes a meal at home so much better than going out for fast food. Give it a try–you won’t be sorry! After you get pretty comfortable with this recipe, you might like to make these for a game day party or casual entertaining. I guarantee your guests will be happy to see a fajita bar! You might want to grill the chicken before freezing to add that smoky flavor. This is my own “recipe” and it’s just what I found worked well for us. Feel free to make it your own and share with us your variations! Click on any of the labels below this post for more ideas and recipes. so easy yet so delicious.nice recipe and nice ur writing as well.thanks for the recipe. It really is. All you need to do is cut up an onion and a pepper! Thanks for stopping by!